That looks like some of the seating, today invisible, to my ignorant eyes. I wonder if there is an account of the excavations in English or French anywhere? THE HIPPODROME (SULTANAHMET OR AT MEYDANI) EXCAVATIONS AT ISTANBUL. Situated close to the Mesa or Middle Street, to St. Sophia and to the Emperors’ Great Palace, the Hippodrome was not only the meeting-place of chariot-racing enthusiasts, but also the starting-point of numerous political riots and revolutions.lt thus played an active and very important part in the history of Byzantium since the IVth century A.D.
Its axis, the «Spina», was decorated with rare works of art and monuments, some of which remained in situ to this day and can be seen on the Sultanahmet Meydam in Istanbul. The seats were built around the race-track, with the Imperial box in the place of honour. North-West of the Great Palace and the Hippodrome, were the residences of high dignitaries of the Empire and, among these, the beautiful palaces of Lausos, patrician and governor under the Emperor Arcadius (395/408 A.D.) and of Antiochos who was councillor to young Theodosius II (408/450 A.D.). He later attained the highest honours but died a priest. His name was given to the quarter of Byzantium where he had lived and the Antiochos Gate was one of the main entrances to the Hippodrome. Small churches and other monuments existed in the vicinity, but they disappeared in the course of time. 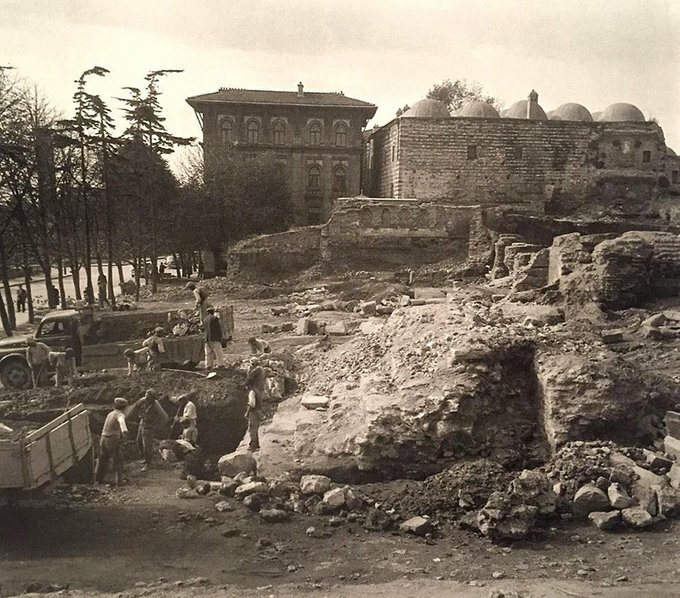 In 1950, while laying the foundations of a Court of Justice, so many valuable fragments were brought to light that the Museum of Antiquities at Istanbul intervened and began, with the support of the Ministry of education, the systematic excavation of the site, recording and preservating, whenever possible, important remains, under the supervision of Bay Rustem Duyuran, Assistant Director. A) . 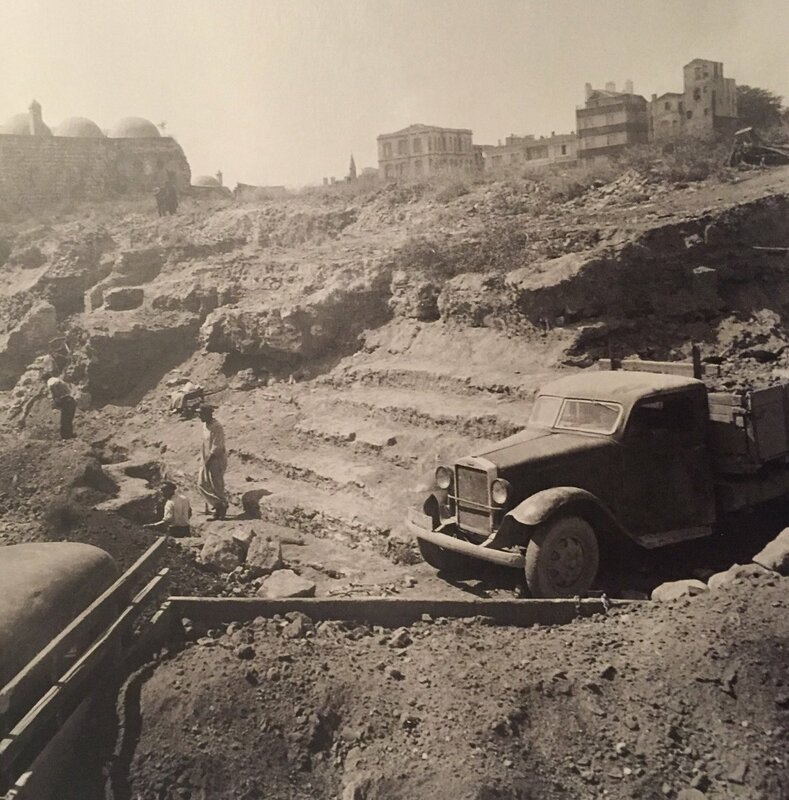 Buildings grouped around the Martyrion of St. Euphemia (Vth century A.D.) excavated in 1942 by Dr. A. M. Schneider, of the German Archaeological Institute at Istanbul. The church of St. Euphemia was adjacent to a «porticus semirotunda», a semi-circular portico, the axis of which was parallel to the Hippodrome. Excavations in 1950 showed that the building, which subsequently became the Martyrion, was originally the center of a complex of rooms disposed along this portico, the whole being part of a large palace. It is hoped that further excavations will enable the more exact designation of the ruins uncovered, as they coincide with the emplacement where the palaces of Lausos and Antiochos had once stood. Traces of frescoes were discovered on the walls of a small church close to St. Euphemia. Both its floor and that of another building nearby were covered with «opus sectile» polychrome marble pavements of floral and geometric designs. A IXth century frescoe of the Deisis (Adoration of Christ), already published by Dr. Schneider, was brought to light West of St. Euphemia, as well as another wall-painting representing a cross among flowers, which probably belongs to the period of the Latin conquest of Constantinople (XIIIth century A.D.). B) . Archaeological remains connected with the Hippodrome. This area is close to the Atmeydani and parallel to it. Six rows of seats «in situ» were first excavated. The lowest row is almost on level with the Atmeydani. A trench dug in front of the seats struck the Hippodrome pavement at a depth of 4 m, 46. 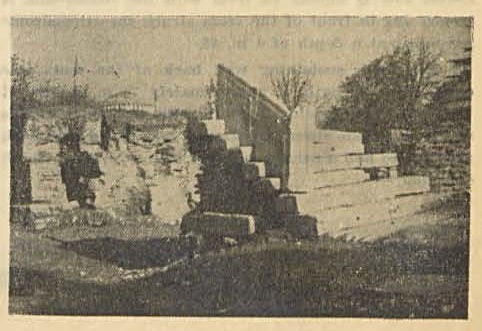 The thick sustaining wall back of the seats was cleared on a length of approximately 70 m. Behind it was a staircase leading to the highest row. Back of this staircase, a wide street appeared. It was paved with dark grey stones and a canal ran under it in a North to South direction. According to the building technique and the materials used, the earliest structures belong to the period of Septimus Severus (beginning of the third century A.D.). A bath ends the street on the West. Although rebuilt in early Turkish times, it was originally Byzantine. On either side of it was a marble staircase. The stairs on the right lead to a semi-circular gateway consisting of four steps: this probably was the famous Antiochos Gate. A third area (C), lying between the Hippodrome and St. Euphemia, is to be excavated in 1951-52. Soundings made in the «Earliest Level», the thickness of which is of 40/50 cm. over virgin soil, uncovered potsherds ranging from the IVth century B.C. to late Roman times. Although Byzantine and Islamic pottery was abundant all over the excavations, the disturbed state of the ground, into which so many foundations had been dug at all periods, prevents strati graphical study. About 40 copper coins of the 9th/11th centuries and numerous stamped bricks were collected as well as bronze candelabra and clay lamps. Archaeologists are indebted to the Turkish Government who enabled them to hold up the construction of the new Court of Justice in order to carry out these excavations which are of the highest importance for the historical and topographical study of Byzantium and have awakened a world-wide interest. Most of the information in this summary is extracted from the journals «Anatolian Studies», Vol. 1, 1951 and «Anadolu» No. 1, 1951. Unfortunately Anatolian Studies (which is on JSTOR) does not refer to the Hippodrome excavations. Anadolu is online here, but dates from 1956. But all this is certainly more than we knew before! Thank you! 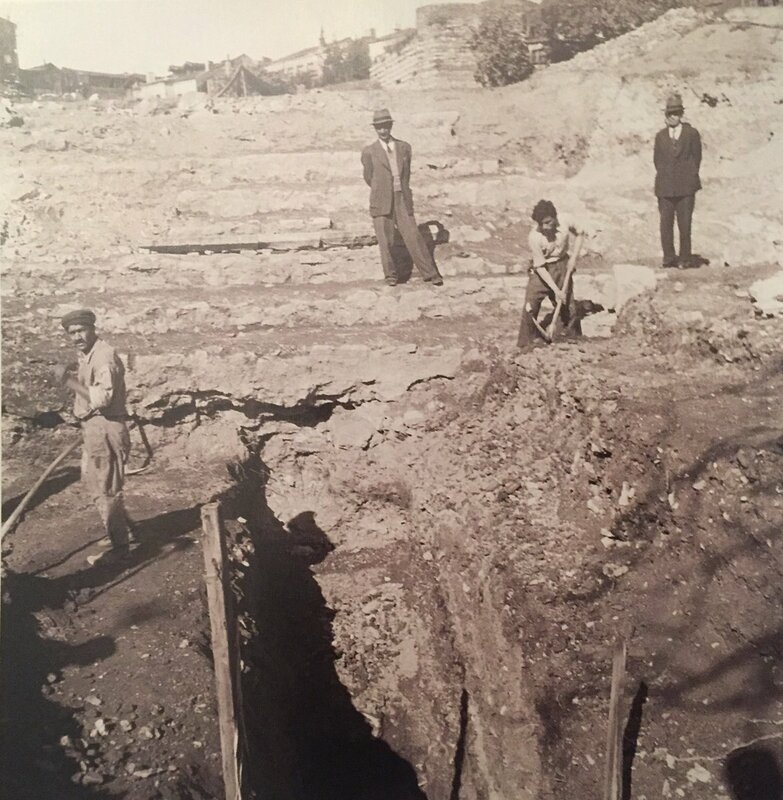 On pages 11-12 at the link below, there is a summary in English of the Turkish journal articles regarding that excavation ın 1950-1951. It’s not exactly official, but seems pretty good for a secondary source. Gosh! Thank you so much! That is indeed quite marvellous.